Getting rid of clothing clutter–that’s easy. Books, however… that’s a different story altogether. 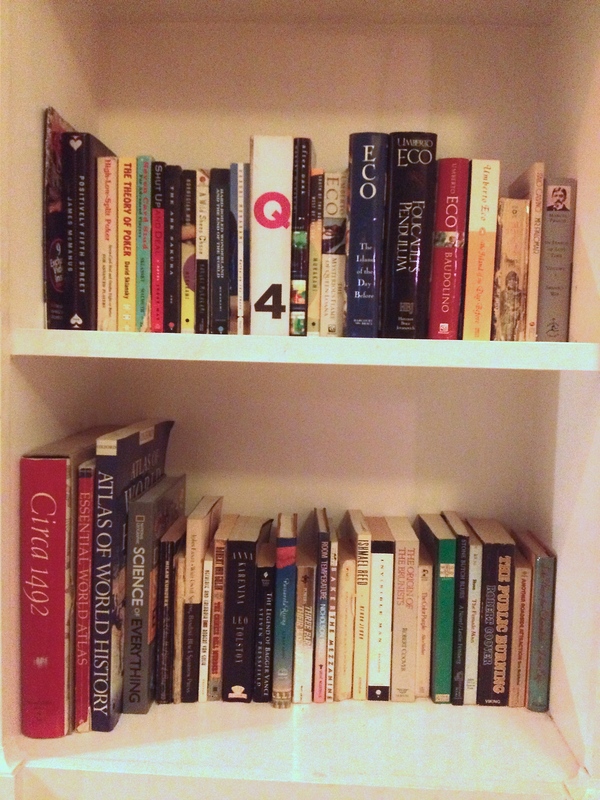 We have books everywhere–far more books than we have bookshelf space. Books are stacked on top of books. Books are squirreled away in corners and in closets. I think we even have books stashed away under beds…. I hold onto books on the logic that someone, someday might want to read what’s on the shelf. Perhaps I will want to reread something. Or perhaps I will need to consult a book as a reference. Or perhaps I will finally get around to reading that tattered paperback I picked up at a used bookstore 25 years ago. And while these events do occur on occasion, they are rare occasions at best. So no major purge tonight–we are going to have to do this one in stages. I simply focused on two shelves on a bookcase I pass every day going up and down the stairs. Some time before Christmas, I cleared out most of this bookshelf. Pretty much I moved things around from one room to another (ok, some re-stacking might have taken place), but I did manage at least to box up a bunch of baby books, which we still need to drop off at consignment or donate somewhere. But I never quite finished. So tonight, I’m just completing a task that should have been wrapped up months ago. And the timing’s right too. As it turns out, my school is having a used book sale next week and is looking for donations. 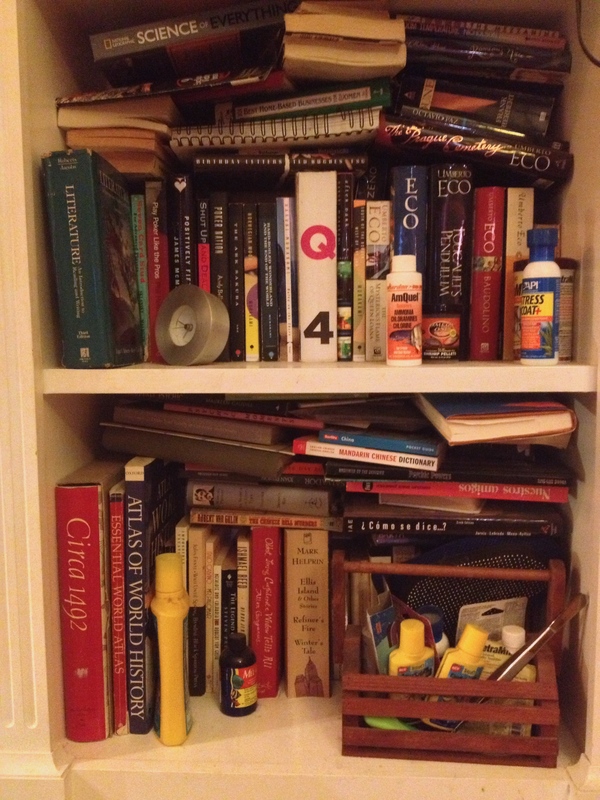 My only goal–get rid of whatever didn’t fit on the shelves, and get them out of the house. With a little rearranging and some selective purging, I managed to get rid of a large tote bag filled to the brim of books that I will probably never want to reread–and I would doubt anyone else in the house would have much use for. I’m not too happy about the arrangement of books that remain on these two shelves (the Library of Congress certainly wouldn’t approve), but it is certainly an improvement. And while I was at it, I got rid of the fish tank supplies that have been sitting on these shelves as well–the tank has been drained and empty of fish since November. I know, two shelves of books and some fish food might not seem like much, but it’s a start! This entry was posted in Uncategorized and tagged clutter, minimalism, organization, reduce, simplify. Bookmark the permalink. We’re moving this weekend and I have been giving away books for months it seems, and I thought I was down to just a few, but having put everything in boxes it turns out I still have four boxes with books. And those are the ones I really love! Crazy! I think books will be the hardest thing for me to shed…. I cleaned off two bookshelves worth of books recently as well. It felt good to have those couple of shelves not double and triple stacked anymore. It looks better and I feel better. I totally understand. Yup–but while I’m in the middle of it, I can barely stand to let go a single book! Happy to have found you Mark! Looks like we have a similar thing going on. Yes, it’s good to find like-minded individuals working through the same issues!